Ed holding Justice right after arrival at our farm. We had already picked out seven possible horses and were heading toward the hallway where the auction takes place. We didn’t see him come in, but suddenly we saw a horse in a pen across from the rest of the horses. He was running up and down the length of the pen, screaming and acting quite hysterical. But he was doing it on three legs. 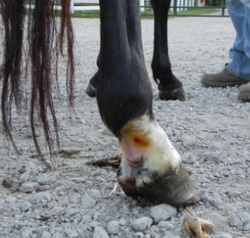 On the back of one of his hind legs, was a gash just above the heel. He was not standing on it at all, so I guessed it was most likely serious. Maria wrote write his number down as our eighth possible pick. He came through quietly, much quieter than when we saw him in the pen. He was small, VERY pretty and well built, but in very obvious pain. He wasn’t putting any weight on that leg at ALL and that concerned us. But, $70.00 later, he was ours. I thought, “hopefully this cut isn’t too serious” he’s a pretty nice little gelding. When we went to the pickup pens to start getting everybody wrapped and ready, we found him in a pen by himself. We wondered why, since most of the other horses were in groups. He was so very quiet and easy to handle. So, imagine our surprise when we looked and found out he was a stallion! Oops. By this time, we had won THREE mares. How were we going to get a stallion home on the same stock trailer with three mares without some kind of accident? Fortunately, he turned out to be probably THE MOST agreeable stallion we have ever had the pleasure of handling. We medicated and wrapped his hind leg. The gash appeared to go all the way to the bone. He had a terrible fungus all over his face and body and he was pretty underweight and had no muscle tone at all.We suspect he was possibly an Amish breeding stallion, but we'll never know for sure. We trailered him home with the mares without incident. Terrible fungus all over his face. The cut went all the way to the bone.